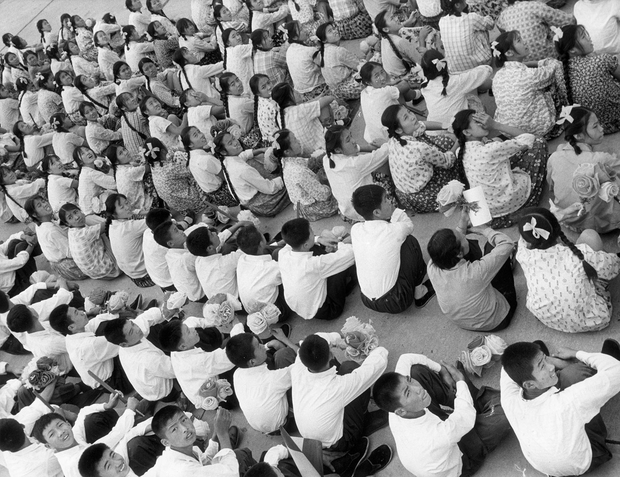 Youths assembled in China, 1973. This article was first published in the March 10, 2016 issue of The New York Review of Books. During decades of reading and reviewing books on China I have learned a great deal, even from those I didn’t like. Only a few have surprised me. Mao’s Lost Children is such a book, and those like me who believe that the Mao period was bad for China and the Chinese will also be surprised—although, as I note below, some of the surprise is negative. It starts with the cover, which shows laughing girls being drawn on an oxcart. Since I supposed that young middle school graduates, or zhiqing, “sent down to the countryside and up to the mountains” to “learn from the peasants” must have had a bad time, I thought initially that the cover was misleading. But in this book, most of the former zhiqing recall happy, or at least nostalgic, years of rustication. Much of this book was published in China in 2011, and all the contributors appeared in a later Chinese edition in 2014. The editors, who both live in China, as do most of the contributors, supply a concise and admirably clear explanation of what happened to the 15 million zhiqing, who were sent to the countryside between 1968 and 1980 partly to mitigate the depredations of violent young Red Guards. Sending them “down” would bring them into contact with “the rural masses,” and save the government money for food and education that would not extend to the countryside. It was thought, too, say the editors, that they could help defend China from foreign invasion. Conditions in the countryside, assert the editors, were “extremely harsh”; this does not emerge in most of the testimonies in the book. There may be other cases, but in these “unfamiliar” or “tough” might be better terms. The entire scheme, the editors conclude, was a “resounding economic failure.” The sent-down youngsters added little or nothing to production and ate up food that was in short supply because of Mao’s economic reforms, which were so ruinous for peasant agriculture. But some of the testimonies show that rural children, for instance, learned a good deal from the zhiqing, and went on to better lives than they would have had without such education. fabrication, stealthy substitution, hyperbole and glorification, plagiarizing, and muddling. To ensure that our writing was sufficiently malicious, fraudulent, bombastic and insubstantial, we took to inventing sensational “news” and infusing our writing with fancy alliteration, elaborate rhyming couplets, parataxis, and doggerel. There is one singular account in this collection. He Weixian was rusticated to Hainan when he was 15, and remained there for over 40 years. He always dreamed of going home, he says, and never gave up struggling to do so. His mother and younger brother, who had emigrated to Hong Kong, tried to get him there as well, but he had fallen in love and married a nurse on the island and could not leave her behind. But it was more than devotion that kept him on Hainan. In 2010, now in his fifties, He was told that he would be allowed to leave the island. During the process of arranging his departure he found a letter politically defaming his father. “I feel strongly that the utterly groundless remarks…had shut all doors to my return home. That paper had tied me to Daling [on Hainan] for a good forty-one years!” Once home he was able to have his father’s case annulled, which enabled him and his wife to be registered in his hometown on the mainland. I found this collection fascinating both for what it says and for what is largely missing. The grateful, tender, even happy memories of most of the zhiqing are striking. Most of those whose memories and opinions are recorded here regard their pasts in Hainan as strengthening, even romantic. Being hungry is the most common complaint. The “cultural revolution,” which lasted from May 1966 to October 1976, was responsible for the most severe setback and the heaviest losses suffered by the Party, the state and the people since the founding of the People’s Republic. It was initiated and led by Comrade Mao Zedong. This is the very period in which 15 million zhiqing were rusticated, including those whose largely favorable testimonies from Hainan are quoted many times in Mao’s Lost Children. That some million people died as a result of the Cultural Revolution is not made clear. used to say that the generation of Chinese who were best at thinking for themselves was precisely the sent-down generation, and it was precisely because they had been sent down, could see the falsity of the regime’s ideology and could learn the actual living conditions of ordinary Chinese. Link has also told me of other accounts of urban people being “sent down.” Of these, the most notable is the autobiography of the astrophysicist and human rights champion Fang Lizhi,1 who after Tiananmen escaped with Link’s help to the U.S., where he died. Fang was sent to the countryside in 1957 during the anti-rightist campaign and was constantly dismayed and amazed by how different peasant life was from Maoist fantasies. There is no sign in their reminiscences that any of the Hainan zhiqing in Mao’s Lost Children understood that Maoism had failed the rural poor. I do not assume, however, that this guarantees official pressure on the editors, who make plain their own dislike of what happened to them on Hainan. But while the relatively straightforward Huacheng publishers were involved in the Chinese versions, even they must operate within the Party’s guidelines. Fortunately, although it is patrolled by the security services and periodically shut down, there is hope in the Internet. Millions of Chinese consult it to see what foreigners have to say about China. Often this is believed simply because, like clothing fashions, foreign is better. The Maoist rustications, however, “down to the countryside and up to the mountains,” await shafts of light. While certain truths flicker over this unique book, many of Mao’s children remain truly lost.